← Should electronic vehicles make noise? I am sitting in a room is a piece of experimental music composed by Alvin Lucier in 1969. The work is fascinating to me, because the acoustic of the room is at the heart of how the music evolves during the work. Given the importance of the room to how the music sounds, I wanted to see how it would sound in the extraordinary acoustic of the Inchindown oil tanks that recently got the World Record for the ‘Longest Echo‘. The work normally involves saying a spoken phrase in a room, recording that on a microphone before replaying that through the room again and again. So each subsequent rendition has passed through the room many times. What starts as speech is quickly degraded to unintelligible reverberation, before ending up as simple tones as the feedback loop amplifies resonances of the room. In my rendition, the first recording is within the anechoic chamber at the University of Salford (hence the change in text from the original work). This is then convolved with the impulse response from the Inchindown oil tank to simulate what speaking in the tank would sound like. As the piece progresses, you hear the same speech that has passed, 1,2,3,4,7,11,18,29 and 47 times through the oil tank’s reverberation. The speech degrades much faster in the oil tank compared to what happens when the piece is performed in a concert hall, although the end is almost the same with alien tones emerge. In the case of the oil tank, however, these tones take a long time to build up and decay, because of the extremely long reverberation in the tank. In the original text, Lucier recites, ‘ I regard this activity not so much as a demonstration of a physical fact, but more as a way to smooth out any irregularities my speech might have.’ But for me, the fascination is the intellectual exercise, and the demonstration of the physics. This is what the original speech looks like in a spectrogram. 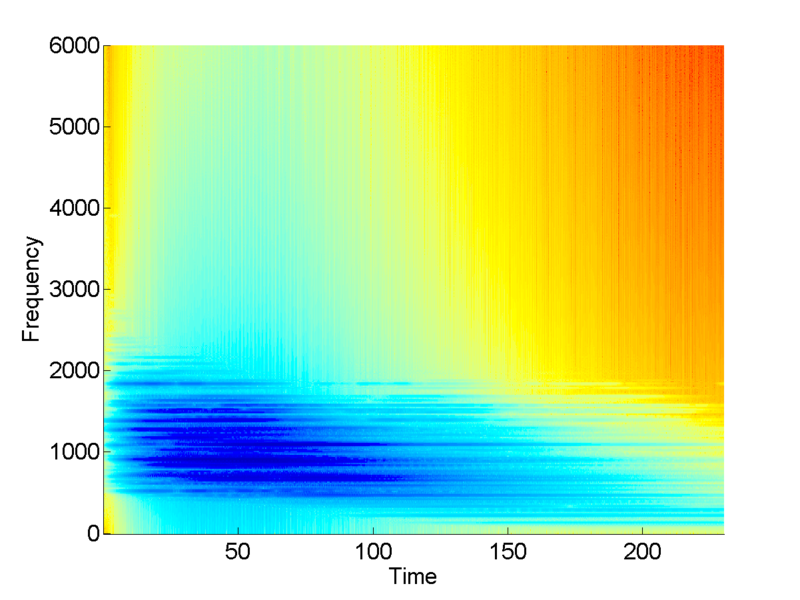 A spectrogram is a common way of representing how the frequency content of speech varies over time. Each stripy column represents a vowel sounds in my speech and the two pale vertical columns are two particularly long silences between words. 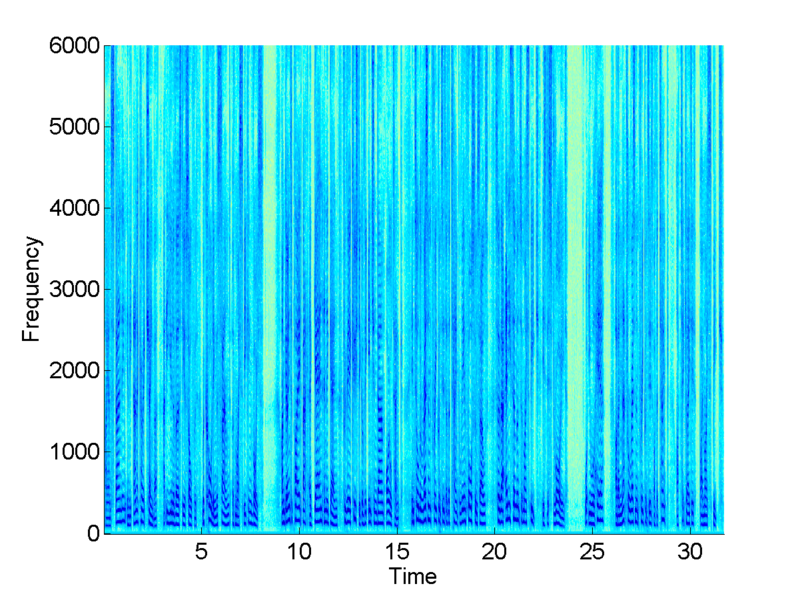 Below is the spectrogram after the speech has passed through the oil tank once. The neat vertical columns have disappeared. This happens because the words have been blurred by the reverberation in the oil tank. The long reverberation in the tank means the sound lasts much longer. The original speech is about 30 seconds long, this sample is now over 100 seconds long. Once the speech has been passed through the tank twice, the speech is already almost unintelligible and starting to sound slightly metallic. 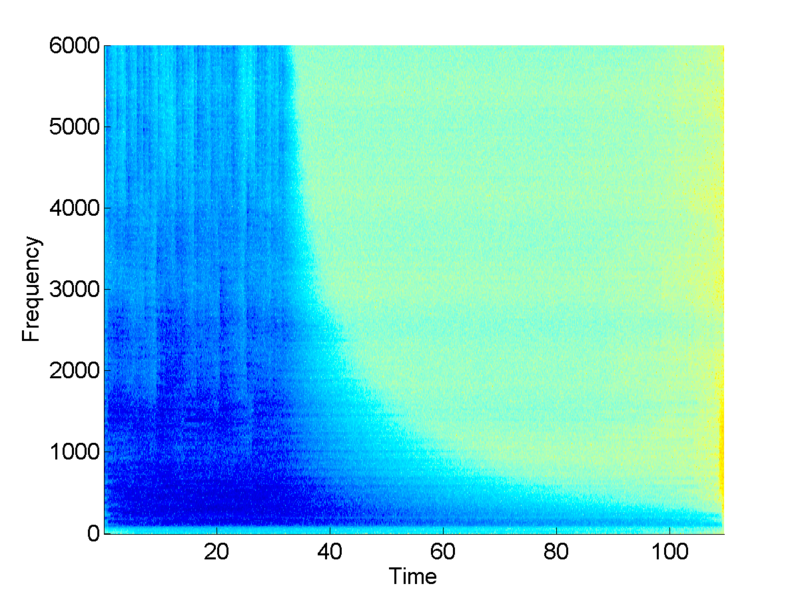 After passing through the tank many times, horizontal lines start appearing in the spectrogram. These are the tones that are heard in the piece. These are the strongest resonances of the room that were picked out by my voice and then over-amplified by the feedback loop. If you want to hear more of the different sound files, you can get hear them on my soundcloud page. Does the piece connect with you emotionally? Or like me, is this just a fascinating intellectual demonstration? This entry was posted in music and tagged alvin lucier, anechoic chamber, convolution, experimental music, i am sitting in a room, i'm sitting in a room, impulse response, inchindown, music. Bookmark the permalink. Ok, I began by thinking this would be a neat mental experiment, but somehow it morphed into something quite visceral. Some of the pieces, around 4-11 passes are strangely attractive. The last ones not so much, perhaps the loud monotone is not as intriguing? When I’ve seen the piece performed in person, it does become an emotional piece. I still remember experiencing from over ten years ago. It creates a unique connection between time and space, and perhaps even mortality. The listener pulls out something unique from the text, recording and space with each time through the loop. Some performances are hard to extract from its live moment with a recording, I think this piece is one of them. I’m sure if you sat in the oil tank, and actually re-recorded this text 47 times you would have a very different experience. Just being in that tank for 90 minutes is probably quite an experience. But with a real recording every movement and every cough gets mixed into the recording as it evolves. When its run as a digital fx process, where each listening is just a click of a mouse, it is just becomes another plugin. If I ever get the chance to visit this place, I’m sure my mindset would be very different. Regardless, I think its still neat way to create new sounds that are otherworldly. I listened to these when they were first posted and again today, this time with headphones. My reaction is the same either way–I feel very disturbed, dizzy, almost ill. The sound has a frightening quality that sounds like something swarming. I am really intrigued. Thank you for this strange experience.